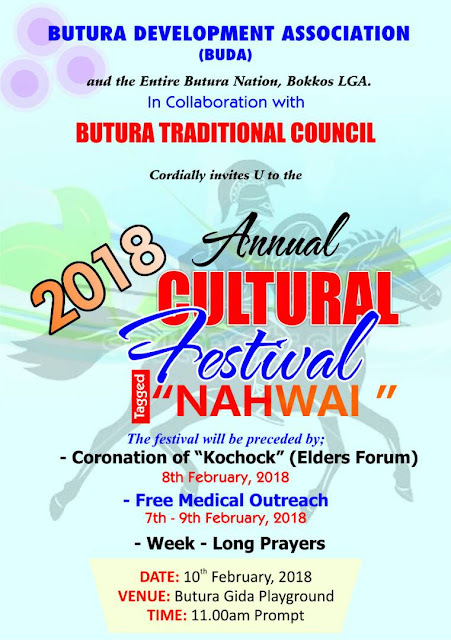 The Butura Development Association (BUDA) in conjunction with the Butura Traditional Council is set to hold its 2018 annual cultural festival tagged, "NAHWAI". The program scheduled for the10th of February, 2018 at the Butura Gida Playground, West of Bokkos, Plateau State by 11:00 is to be preceded by a free medical outreach from 7th and 9th February, 2018. It is also to witness the coronation of the traditional council's Elders Forum otherwise known as "KOCHOCK" on 8th February, 2018. The event is to be under the Distinguished Chairmanships of Barr.Jonathan Mawiyau, Attorney General and Commissioner for Justice, and Hon. Linda Barau, Commissioner of Agriculture, Plateau State. The Special Guest of Honour for the day is His Excellency, Rt. Hon. Barr.Simon Bako Lalong, Executive Governor of Plateau State with Da John Mallo Maqual, the Saf Butura as Chief Host. Royal Fathers of the Day include Mishkaham Mwagahavul, HRH Da Nelson Bakfur, the Sum Pyem, HRH Charles Mato Dakat and Saf Bokkos. Da Monday Adanchin. Enquiries according to the event fliers can be channelled to Commander Garry Matyek Rtd on 08037257685, Mr. Ibrahim M. Makut, 08035656746, Barr. Samuel Mafuyai, 08035920995 or Mr. Sunday Damla, 08055119821.